In the context of the current national conversation about pain and the use (and overuse) of opioids, studies continue to show that the use of physical therapy instead of prescription medication is an effective and safe pain-relieving option for the aging adult, according to Paul Gardner, PT, GCS, of Hillcrest Physical Therapy. In fact, in 2016 the Centers for Disease Control & Prevention (CDC) issued a prominent report that lists physical therapy and exercise as options for managing chronic pain that “may actually work better” than oft-abused opiate painkillers like Vicodin and OxyContin – and with fewer risks and side effects. Older adults are at an increased risk of the side effects associated with these opioids due to polypharmacy and other changes of normal aging. Chronic pain is generally defined as pain that lasts longer than three months and may be caused by injury, an ongoing illness like cancer, or in some cases, there may not be any clear cause. As pain persists, various factors come into play that need to be dealt with to have a successful outcome. Physical therapists are experts in pain, movement and exercise. They provide a comprehensive evaluation to identify causes of pain and rule out harmful red flags to ensure safe progression of activity. They not only evaluate strength and flexibility, but also fear and avoidance of activity to help get people back to doing the things they love. To move forward, the physical therapist and patient will discuss goals, design a treatment plan and begin activities to address movement, flexibility and functionality. Education is provided to empower patients to take control of their pain. Current research overwhelmingly shows that having increased knowledge about chronic pain as well as incorporating exercise/physical activity into treatment helps to decrease pain and improve overall function. A physical therapist is an optimal professional to help instill this knowledge and provide sound activity recommendations to start them on their way to reclaiming their life in a safe and healthy manner. A study undertaken by researchers from the University of Washington in Seattle and George Washington University in Washington D.C. found that patients who saw a physical therapist before trying other treatments had an 89 percent lower probability of eventually needing an opioid prescription, a 28 percent lower probability of having any advanced imaging services and a 15 percent lower probability of making one or more visits to the emergency room. Despite the mounting evidence that physical therapy can reduce or eliminate dependence on opioids, Gardner expects it to be an ongoing conversation. 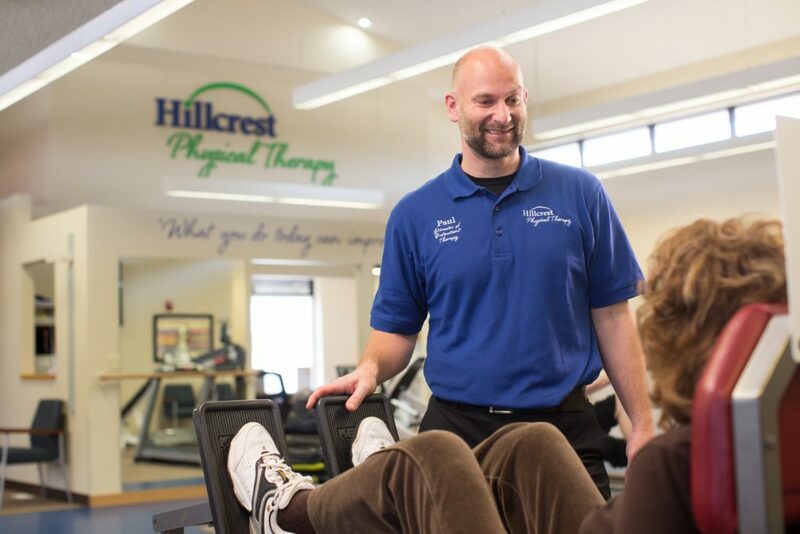 To learn about Hillcrest’s outpatient physical therapy clinic that’s dedicated to the 50+ population, click here or call (402) 682-4210.